As tears swelled in his eyes, Burns and several of his friends locked arms with a group of older activists and made the walk across the Edmund Pettus Bridge on Sunday, just as President Barack Obama and others had done the day before, and just as the young John Lewis—then an activist with the Student Nonviolent Coordinating Committee (SNCC) and now a congressman from Georgia—had done five decades ago. Back then, Lewis was one of about 600 demonstrators who set out on a 50-mile march to Montgomery for voting rights, when Sheriff Jim Clark’s deputies met them at the foot of the bridge and attacked them with billy clubs and tear gas. Lewis, 74, was clobbered across the head with a billy club and suffered a skull fracture. “Our country will never be the same because of what happened on this bridge,” he told the crowd that lined the streets and stood in silence as he spoke. 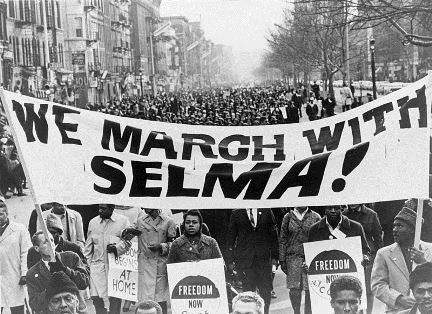 Obama, who was introduced by Lewis, said that Selma was an important milestone in the fight for civil rights. In the wake of a rash of recent police shootings of unarmed Black men across the country, young activists like Burns said that a new generation is now charged with pushing the movement forward. That kind of thinking makes sense to Dr. Khalilah L. Brown-Dean, an associate professor of political science at Quinnipiac University and a prominent researcher and scholar. As Brown-Dean stood on the bridge, she met two Black women who were legally allowed to marry in the state. Their fight for marriage equality represents the new frontier in the movement.